To prevent accidental operation, never leave the Smart Key in the vehicle if children or animals are also left in the vehicle. Note: The operational range of the Smart Key will vary considerably depending on atmospheric conditions and interference from other transmitting devices. Note: If any door or the tailgate is unlocked 10 times within a short period, the latch is disabled for approximately one minute. The vehicle is supplied with two Smart Keys. The Smart Keys act as remote controls for the locking and alarm system and allow the vehicle to be locked, unlocked and driven without the use of a conventional key. See 7, KEYLESS ENTRY, 13, KEYLESS LOCKING and 77, ENGINE STARTING. Each Smart Key also has an emergency key housed in a slide out compartment. 1. Lock: - Press to secure the vehicle. The vehicle can be Single or Double locked. See 12, SINGLE LOCKING. See 13, DOUBLE LOCKING. See also 13, GLOBAL CLOSING. 2. Unlock: - Press briefly to unlock the vehicle and deactivate the alarm. See 6, SINGLE-POINT/MULTI-POINT ENTRY. The hazard warning lamps will flash twice to indicate that the vehicle is unlocked and the alarm has been deactivated. The interior lamps and puddle lamps will illuminate to assist entry to the vehicle. See also 6, GLOBAL OPENING. Power fold mirrors will unfold (if enabled). 3. Tailgate release: - Press briefly to open the tailgate. If the vehicle is locked and armed, the security system will remain active while the tailgate is open, but intrusion and inclination sensing systems will be disabled. When closing the tailgate again, if the vehicle is already locked and armed, the hazard warning lamps will flash after a few seconds to confirm the full alarm system has been reactivated. There will also be an audible sound if the vehicle was double locked. See 8, OPERATING THE TAILGATE. Ensure that the Smart Key does not remain in the vehicle prior to closure. If the vehicle is in an area of localised RF interference or the Smart Key is shielded by metal objects, the vehicle may close and lock with no means of opening again. 4. Panic alarm: - Press and hold for 3 seconds (or press 3 times within 3 seconds) to activate the horn and the hazard lamps. - Once active for more than 5 seconds, the alarm can be cancelled by pressing the button and holding for 3 seconds (or pressing 3 times within 3 seconds). - The emergency alarm will also be cancelled if a valid Smart Key is present when the START/STOP button is pressed. 5. Approach lighting: - When approaching the vehicle during darkness, press to switch on the approach illumination. Press again to turn the approach lamps off. - The approach illumination period set at the factory is 30 seconds. This delay period may be configured to provide illumination lasting between 0 and 240 seconds. See, VEHICLE INFORMATION AND SETTINGS MENU. Note: In some markets a second press of the button will turn on the headlamps and reversing lamps. A third press will be required to turn the lamps off. 6. Emergency key access: Slide open the side cover. 7. Remove the emergency key blade and unfold. 8. 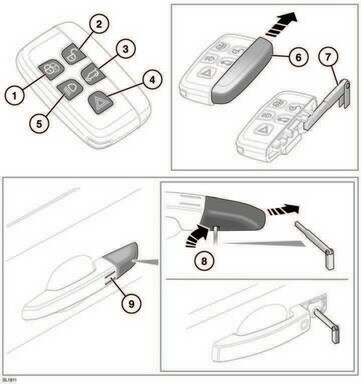 If the Smart Key fails to open the vehicle, insert the key blade into the slot at the base of the door lock cover and gently lever the key blade upwards. Carefully twist the key blade, to lever the cover off the retaining clips. Insert the key blade into the exposed lock and turn to operate the lock. The alarm will sound. Note: When the left hand front door is unlocked using the key blade, the alarm will sound until the Smart Key is positioned correctly. Note: A replacement Smart Key can be obtained only from your Land Rover Dealer. The Dealer will require proof of identification and ownership. Notify your Dealer immediately if a Smart Key is lost or stolen. 9. Keyless entry/exit: - Door handles with lock sensors.